If you are looking for a little inspiration for the weekend, you need look no further than Alex Quick’s book, ” 102 Thing To Do In Autumn”, R.R.P. £8.99. 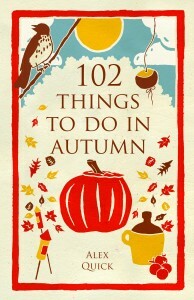 The book is great source of ideas on how to enjoy the best of this season of misty mornings and harvest plenty. Some of the ideas include, making rosehip syrup, making an apple doll, or take part in an alien moth survey of the invasive species of moth are blighting horse-chestnut (conker) trees. The leaf-mining moth’s caterpillars eat the leaves from the inside causing the leaves to turn white, and then brown. Infected trees are weakened, and produce smaller conkers. So some suggestions are merely joyful, others have other virtues!